Customer Resource @ Stouffville Toyota Stouffville Dealer ON. Meet the Stouffville Toyota Service Team! Fall, the leaves are falling, the air is changing and the white stuff is inevitably getting closer. As everyone knows, winter is the worst time to have an issue with your vehicle. With that in mind, here are 5 things you should do or at least look at while the weather is good. Check your wiper blades. We all know it, the autumn and winter can be wet and slushy. How many times have you found yourself driving to work and the muddy slush is pelting your windshield? I certainly have, and there is nothing like having your wiper blades work properly - pure pleasure and safety. Check your spare Tire. Obviously you don't plan on using your spare, however, should you find yourself needing it, the last thing you want is to do is pull out a flat spare. Take a few minutes to make sure it is inflated properly and that it is in good condition. Inspect your battery. The cold can bring out the best and worst in our vehicles - especially in our batteries. Have yours checked to make sure it is charging properly, that the wire connections are tight and clean. Brake System. Stopping is an integral part of driving safely. The fall is a great time to have your brakes checked. This includes the pads, rotors and fluid. Each are key to helping keep you safe until the spring. Change to winter tires. It's a proven fact, when the temperature drops, even all season tires begin to loose their grip on things. This is a great time to switch back to your scientifically designed winter tires to ensure maximum grip on the road. If you have more questions about fall maintenance, don't hesitate to contact our wonderful service department. Until we see you, happy driving. Kuls de la Cruz is the Operations Manager at Stouffville Toyota Scion. In case you haven't noticed, the weather has begun to shift and the trees that abound throughout Ontario have begun to prep for the long winter. Leaves have slowly started to change from green to brilliant hues of red, yellow and orange. 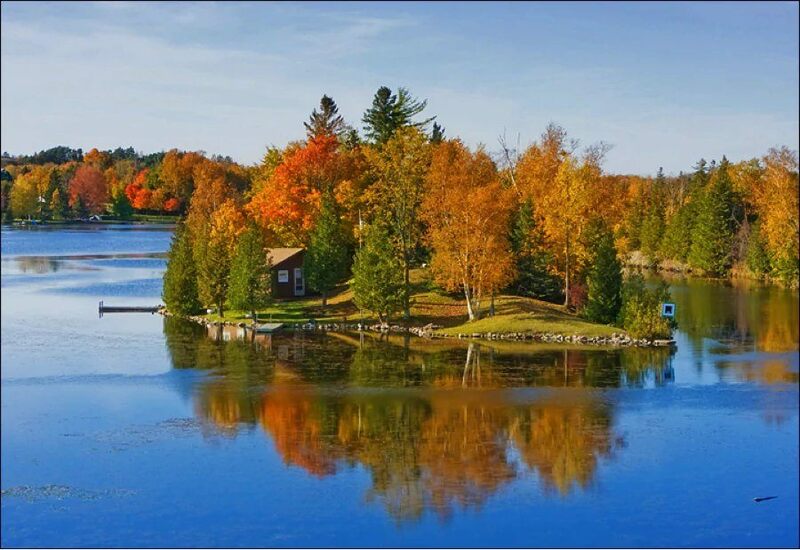 It's actually one of the most beautiful times of year to live in Ontario. 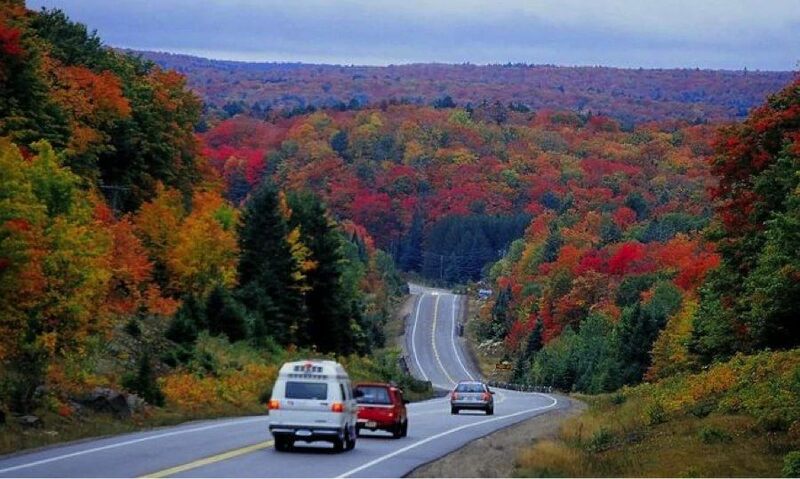 So with that in mind, we though we would share some of our favorite places for a fall drive. Sure, this may be the most obvious, but for good reason. The natural beauty of the rolling hills, rocks and lakes mixed with the fact that there are wildlife surprises around almost any corner make this our top choice. Starting in Stouffville, you should plan a full day. Head north through Beaverton, catching some great views of Lake Simcoe, then past Gravenhurst and into Huntsville - a Great stop for some food and shopping. From there, you will enter Algonquin Park; a place you should plan to enjoy. Park your car and go for a hike on one of the many trails, and don't forget your camera! The views are amazing! Once you are done hiking, jump in your car and head south east, out of the park and down through Bancroft. Swing into a local café for some treats and continue on the drive home, enjoying every km of natural beauty. The loop is about 500km of natural beauty. A little closer to home, the Kawartha Lakes drive has a beauty of it's own. There are loads of lovely treat shops on the way - yum. You should definitely try some Kawartha Dairy ice cream while in the kawarthas! On the drive you will also encounter windy roads, hills, lakes, rocks and maybe some deer or moose!! Starting in Stouffville, head East on hwy 7A, right out past Peterborough. Once you hit the cute town of Norwood, turn North on 46 and enjoy the fall foiliage and winding roads. A stop in Apsley for lunch and then head south past the Kawartha Highlands Provincial Park - worth a stop in if you'd like to go for a walk. Once you hit Buckhorn, you will wind your way south west, watching as the landscape changes from hilly rocks to the rolling farms that surround Stouffville. The route is about 400km of memories. About a 600km drive, you will get to encounter some incredible views. Heading west on Hwy 9, then north on Hwy 10, you will encounter a mixed landscape of rolling farmland and dense forests. The views of farm fields with huge bails of hay on a backdrop of orange, red and yellow trees makes for some excellent photos. From there, you will enter the Grey-Bruce peninsula. Now if you've never been this way before, you absolutely MUST stop in at Grey-Bruce National Park. The cliffs, changing colors of the leaves and Caribbean like water will take your breathe away. Heading back, try the route through Collingwood and into Barrie. If you have time, a stop in Wasaga Beach will be refreshing. You know, there is nothing like the feeling of sand in your toes as you gaze out on the huge expanse that is Georgian Bay. The loop takes you about 600km, if you head to the tip of the peninsula and wave to Manitoulin Island. 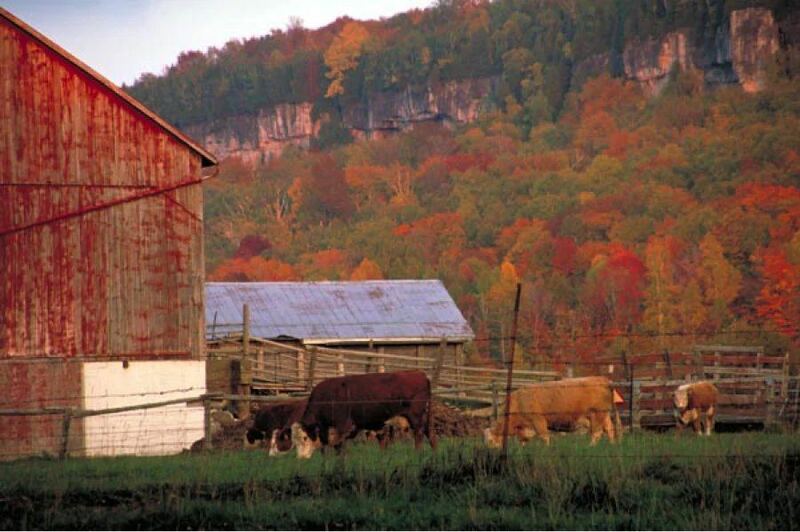 Most think you need to head north for the fall colors, but that's not always the case. The Niagara Escarpment is a fantastic place to enjoy the natural fall beauty with some additional activities not found in Northern Ontario. Try a scenic drive toward Niagara along the top of the escarpment. Then drive past the mighty Niagara Falls before meandering along the Niagara River toward Niagara on the Lake (WOW! That was a lot of "Niagara's" in one sentence!). There you can enjoy a picturesque meal before heading into the heart of Ontario's award winning wine country. While there, why not stop for a tour or two. The backdrop of Lake Ontario and the Niagara Escarpment will take your breath away. If you try this route with kids, plan to spend a little more time in Niagara Falls. From Stouffville, the loop is about 250 km of urban and rural beauty. There are literally thousands of routes around Ontario. Each one offers something unique, but all have one common denominator - Breath taking beauty. So instead of limiting your fall leaves experience to raking your yard, try loading up your ride and hitting the road for some adventure! It's that time of year again, one of the most celebrated and joyful times. A time for new beginnings, for a fresh start, for new friends. It's back to School time!! As every parent knows, back to school time brings about some challenges in feeding your kids. After all, a bologna sandwich 5 times a week can get old real fast. Don't believe me? Try it yourself!!! Here are 4 great tips to help feed your kids through the next year. 1 - Think outside the bread loaf! As great as sandwiches are, other options can keep things fresh and enjoyable. Instead try a wrap or pita. Other times you can simply use your leftovers - seriously, leftovers can be better than anything else you give them! 2 - Freshen up the snacks. Yes, it's easy to buy pre-made, boxed snacks for lunches, but a little effort will keep things fresh, enjoyable and healthy. Try some carrot sticks with dip, or maybe some yummy berries in a re-usable container. You could also put a twist on traditional fruit. Instead of just dropping an apple into your kid's lunch, try slicing it up and adding a little cinnamon. Or maybe slice a banana and peach for a fruit salad. 3 - Water Bottles! Sure, you've done juice boxes and cans of pop for years, but those are just loaded with SUGAR!! Not to mention the fact that they simply do not quench thirst as well as good old water. Invest in a quality water bottle and your child can re-fill it all day long. 4 - Ditch the plastic bags. I know, you've probably heard this before, but plastic bags take a really loooong time to break down. Instead invest in a few quality re-usable containers. No, I don't mean the cheapest ones you can find. It's worth spending a little more to ensure they do not come open on the way to school. And at the end of the day, spending $20 on a few quality containers that will last the year is better than spending the same on plastic bags (one kid will use between 600 & 800 in a school year!!). New Vehicle Sales manager, Dad and Husband to a Great Wife. With the current Scion iM giveaway going on, we started thinking about great road trips. The ups, the downs and all the things we should have done. Here are 4 great tips to make your summer ending venture more fun than you expected. 1 - Clean your Vehicle!! Seriously, this is not a joke. There is nothing worse than hitting the road, and smelling last week's burger hiding under a seat. Besides, a clean vehicle is more relaxing and enjoyable to ride in. 2 - Pack wisely. As any parent with kids knows, an emergency clothes change can come out of nowhere. Well, on a road trip, the same can apply to "mature" adults. Spilt coffee, waiting too long to stop at the next restroom, these situations call for a quick change of clothes and nothing is worse than unpacking your vehicle to find a new shirt. Make sure you have your clothes and necessaries accessible when you pack for the next ride. 3 - Media!! Whether you have kids, teenagers, are just hitting the road with some friends, scenery and excitement will only take you so far (unless you love sing-alongs, they can help you cover hundreds of KM). Good tunes, some podcasts and movies go a long way - and it's still ok to break into songs! 4 - Plan and Be Flexible. Every great road trip starts with a plan, but executing the plan should not be your top priority. Every great road trip includes some randomness, stopping at unexpected places - like the giant apple on the side of the 401 between Ottawa and Toronto for some fresh apple pie. Or maybe it's stopping at a beautiful waterfall and river to cool your feet. So hit the road, create some memories and have fun! It's been seven short years since I won a trip to Toyota's inaugural NASCAR race (which I had to miss by the way). Although they had a bit of a bumpy start into this domestic dominated sport, their innovation and development have grown leaps and bounds. 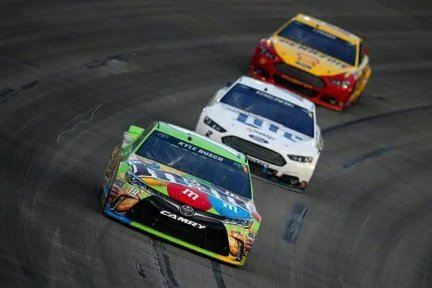 In fact, earlier this month at the Quaker State 400 in Kentucky, Toyota driven cars took 4 of the top 5 spots, including the winner, Kyle Busch. Since it's founding in 1948, the NASCAR series has been a club for domestic manufacturers, the big three so to speak (Ford, GM and Chrysler). As a matter of fact, it was not until Toyota came along that an import dared to invest in and compete in this sport at the level Toyota has. And compete they have. Since 2007, Toyota has consistently evolved and improved their performance, even taking pieces of technology and bringing them to their mainstream lineup (whether it was safety or performance oriented). Benefits you now get to enjoy! Why do I need so many Oil Changes? Oil Change time. Just another way for dealers to get my money you think. A hassle and waste of time. Another opportunity for dealers to tell you of other "problems" with your beloved ride. Well, the truth is not quite as you think. First, you need to understand that your vehicles engine is made up of many unique and precise parts. When your engine is operating, these parts move at incredible rates of speed, creating lots of friction, which in turn produces lots of heat. Oil has a simple, yet vital role - to lubricate these parts as they function, keeping the friction in check and the heat down. The end result is an engine that functions smooth and reliably. Take away the oil and it won't be long before the engine has problems. So now you think, "I have oil in my engine, why do I need to change it?" Well, like any good quality food, there is a shelf life. When being used, oil begins to break down and loose effectiveness. As a result, you must change your oil, before it becomes thick and gummy, clogging your engine. "So why do manufacturers recommend a certain time or number of miles for every oil change?". They have also done extensive testing and know what is good for you. A happy customer will return, an unhappy customer will not. Think; how would you feel if the manufacturer said oil changes every 20,000km - you follow the guidelines and your engine blows after one year of driving. That's right. Not nice. Reputable car dealers and manufacturers want to continue selling vehicles - if you are unhappy with the reliability of your vehicle, are you likely to buy another? NO. They truly want to take care of you and have happy customers. So at the end of the day, oil changes can actually save you a load of money in the long run. So make sure you continue to keep your oil changed and fresh. Happy oil is a happy car! Kuls' Car Care Tips: Are you driving with a cracked or chipped windshield? Let's face it; we've all likely experienced the thrill of driving behind a gravel truck on the highway. The adventure and excitement of dodging each stone and pebble that bounces free - it almost feels like you are Han Solo flying the millennium falcon through an asteroid field. Ok, ok. So the reality is - it's not actually that fun. And the byproduct is usually some type of chip or crack in your vehicle - usually in the windshield. But why should you care? Your windshield should be fine with a few chips right? WRONG!! Here are 4 reasons you need to fix those pesky chips and cracks. 1- You can get a ticket! Although it's not "illegal" per se, you could still get a ticket if the crack/chip inhibits the drivers view. In Ontario - that could cost you $110. 2 - Structural Stability of your vehicle could be compromised. Although you may not guess it, your windshield actually plays an important role in the integrity of your vehicle. Having cracks or chips could weaken the strength should you get into an accident. In the case of a rollover, should the windshield fail, the cabin could be crushed, causing serious injury to the occupants. 3 - Your windshield is a delicately designed piece of glass - intended to hold together in case of an accident. Having cracks or chips can actually cause the windshield to shatter in an accident - causing more harm than you like. 4 - Compromised Air Bag deployment. In many vehicles, the passenger side air bag deployment is actually dependent on the windshield. When the air bag inflates, it uses the windshield to ensure it deploys toward the passenger. Cracks and chips can weaken the windshield to the point where the air bag can actually shatter the windshield and not provide the safety needed for the passenger. So although they look small and insignificant, chips and cracks should be taken care of as soon as possible. Small chips and cracks can often be repaired, while larger ones may require the windshield to be replaced. If you are unsure, stop by. We will take a look and let you know the best way to proceed. Let's face it, there are A LOT of stereotypes and pre-conceived ideas of car dealers. While some of them may have been based on fact, things have dramatically changed over the last 40 years. Here are 4 common misconceptions regarding car dealers. 1 - Car dealers hate educated buyers. Au contraire! Car dealers (and salespeople) actually like when a customer comes in knowing which vehicle they want, what features matter, warranty info, etc. It really saves the dealer time in educating you, because you've already done that. As an educated customer, you are more comfortable making a decision when you do visit the dealer. And with all the information on the internet, the info you find is the same as the info the dealer can show you. 2 - Car dealers make thousands of $$$ off each vehicle sold. Sorry to burst your bubble, but that is simply not true. Most car dealers average around 4% or 5% margin on vehicle sales. That means on a $20,000 car, they will only make about $1,000 - you have to remember, the sales person gets paid, the reception gets paid, there are building costs, heat, hydro, water, etc. Compared to every other retail industry, car dealers have some of the lowest margins. 3 - Car dealers hide lots of extra fees. Nope. The auto industry is actually extremely regulated. All costs must be clearly laid out in the contract - keeping them clear and easy to understand. Yes, there may be some additional fee's, but there is no hiding these and they can be fully explained simply by asking. 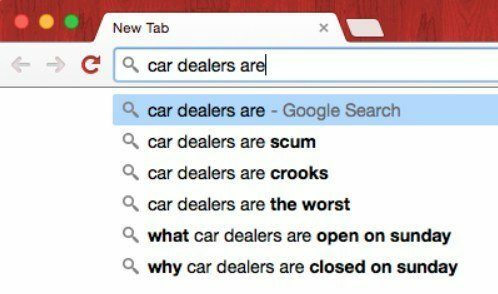 In the past, this may have been the case, but today, there is so much competition out there, that the only way a dealer can survive is to provide you fantastic and ethical service. There is also something called social media - makes it really easy for customers to share their stories - good and bad. So an unethical car dealer has become VERY easy to spot. Obviously there are many other myths out there, but these 4 are by far the most common. At the end of the day, today's dealers are more like the hospitality industry rather than the sales industry. A happy customer is what we all want. 5 Maintenance Tips to keep you rolling into Summer! After a long cold winter we have finally made it to May. And you know what comes in May - the Long weekend kick off to the Summer! That's right, the May 24 is here (well, almost here). There is just enough time to get your vehicle tuned for the annual trek north. Here are 5 things you should take care of (or have taken care of) before hitting the (hopefully) open road! 1 - Get your oil changed. Oil is to the engine what blood is to humans. Try operating without it and you will surely be disappointed. 2 - Put your summer tires back on. It's that time. The snow is gone for good. Getting your summer tires back on is like kicking winter in the…well you know what we mean. 3 - Wheel Balance and Alignment. Naturally, you would expect to be stuck in traffic as the mass exodus north begins, thus denying you the high speeds you would like to travel at. However even when driving at slow speeds, poor tire balancing and alignment can cause unnecessary wear on your vehicle. But should you get the opportunity to cruise the open road, you will want to be sure the ride is smooth. Not to mention that poor balancing and alignment can cause rattles, pulling to the side and poor fuel economy. 4 - Top up your fluids. Radiator fluid, coolant, power steering fluid, brake fluid, etc. Each one plays a vital role in the performance and safety of your vehicle. Make sure they are all clean and full for the best vehicle performance. 5 - Check your air filters. Yes, your vehicle has more than one! One air filter is for your engine, while the other is for your cabin. The better the airflow to the engine, the more efficient it will run. The same goes for the cabin air - although we are hoping for window down weather this May 24! If you are not sure about doing these yourself, simply give our service department a call. Not only will you get to cruise with peace of mind, but you will also get to enjoy our customer lounge with FREE WiFi, coffee, tea, juice, water, snacks, fresh fruit and tv. And if you have your kids, don't worry! We have a special play area for them as well. Kevin has more than 29 years of auto industry experience. He is a resident of Markham Ontario, where he enjoys life with his wife and kids. 4 perils of Spring Driving - Use Caution and Stay Safe! It's finally here! Spring has arrived, and with it comes many great and wonderful driving obstacles. We want everyone to stay safe, so here are some of the things we need to watch out for as the maple sap runs rich and the snow is banished for another season. 1 - Human Obstacles. With the nice weather comes the annual emergence of humans! Be it kids playing in the sun, adults out for a run or the neighbors dog out for a game of catch me if you can, the obstacles are indeed random and appear without warning. So as you cruise through your neighborhood, slow down and pay extra attention. 2 - Wild Obstacles. Many animals hibernate or simply slow down in the winter months. Now that the sun is here, they are out in full force, hunting and searching for food. As they do, they may find their way onto local roads. Be it a deer and her young, chasing squirrels or that meandering bear, these animals can certainly put a dent in your day. 3 - Two Wheels. This is also the time you begin to see bicycles and motorcycles on the road. Pay attention and give them additional space. They lack the airbags you have and carry precious cargo. 4 - Road Debris. It's inevitable. As the snow melts, there is always left behind piles of sand and debris. Use caution when driving. If you find yourself on one of these patches, slow down and use caution, avoiding quick movements. At the end of the day, taking a few extra minutes to reach your destination is better than saving a few minutes to fail getting to your destination. Lloyd has been a part of the Stouffville Toyota team since opening 4 years ago. He is currently enjoying life in Unionville with his lovely wife and three children. With March break rapidly approaching (YAY!!) We thought we'd take this week's blog to share some great local activities to make it most enjoyable. So here are our top 5 March Break activities for the Stouffville Area. 5 - Get out for a Hike!!! It's been a long cold winter. Take some time to hit the many trails and forrest's in and around Stouffville. Some fresh air will help energize the body - and it's great to have the kids running around, spending energy. But Make sure you remember your Mud Boots! And when you are done, why not stop for some yummy Hot Chocolate at the Red Bulb Espresso Bar OR For the Love of Jo - two boutique café's on Main Street. Kevin Baxter is the Dealer Principal at Stouffville Toyota. He is proud to have received the Toyota Pinnacle award for customer service and looks forward to improving on this. As anyone with kids knows, road-trips can be fun, chaotic and expensive. With March break approaching and the annual Canadian family journey to the southern United States about to get underway, we thought we would share some tips to help make the journey that much better. 1 - Don't over-pack This is a classic mistake for all road-trippers. The temptation to bring more simply because you have space in that Sienna van. Well, please do NOT. Over-packing causes discomfort on the journey and frustration when trying to find something. Not to mention the fact that you must unload it all and repack for the journey back (after some shopping!!). 2 - Think about your tummy Many road-trips include frequent stops at fast food joints to "speed" the trip up. This is a classic miscue. Fast food stops will eat into your budget and are generally not the healthiest choices. Instead, try to pack some healthy treats as snacks and look ahead to find a good sit down restaurant. Every time we head to Florida we stop at Kings Family restaurant in the Pittsburgh area or Fat's in the Carolinas. Some good hearty food and a break from driving generally improves family morale. 3 - Mark your fuel stops There are different gas prices in different areas. For example, fuel in the Stouffville area is often less expensive than fuel in Markham or Richmond Hill. On the drive from Ontario to the sunny southern United States the fuel prices change from state to state. They can actually vary by up to $1/gallon. This is not a huge amount, but on vacation, every $10 saved on fuel is $10 to spend on food, shopping and activities. And really, saving money on fuel always makes me happy! 4 - Redbox If you have a DVD player in your vehicle, the Redbox is a wonderful thing. You can rent in one location and return at another. This means non-stop new movies to enjoy for only $1.29 per rental. Rent at your first gas break and return when you get to your destination. Great value and variety to mix into your trip. 5 - Rest As tough as it is, one of the best things you can do before going on a road-trip is to get some good rest prior to departure. Many accidents are caused by being overtired. Don't try to be tough and push through. Pull over if you need to. In the grand scheme, an extra hour is not going to hurt anyone. Hope you find this useful and enjoy your next family road-trip! Kuls Dela Cruz is the Operations Manager at Stouffville Toyota. His car care tips come out each month and are meant to inform and empower you. How great is your service shop? It is said over and over, take you vehicle to a reputable dealer for regular service. Well, this is something I experienced recently. Obviously I took my wife's Toyota Sienna into Stouffville Toyota for an oil change. Thankfully, the service tech took the time to look over the vehicle and ensure it was in great running condition. He noticed something I had not, a three-inch gash in the front drivers side tire!!! Thankfully, I was able to get the tire replaced the same day and was again driving happily down the road. So when you are considering where to take your vehicle for service, remember, there is more to an oil change than meets the eye. Does your shop just change the oil? Or do they watch over your vehicle like a guardian angel? If they don't, it could be time to find a new shop. Winter tires are more than safe. They can save you money too! For years, people have been installing winter tires for additional safety while out on the road. The main reason is that winter tires are manufactured with a special rubber compound, allowing the tire to continue to flex when temperatures dip (or Plummet) below 7 degrees Celsius. This helps prevent snow build-up on the tire and maintain traction on the roads. As a matter of fact, having four winter tires on your vehicle can reduce stopping distance by up to 25% or between 2 and 3 car lengths (also known as the difference between rear ending someone and stopping safely). Just recently, there have been some incredible developments. Insurance companies (*some but not all) have begun to give a discount of approximately 5% to customers that use winter tires. So not only will you be safe and secure on the frozen tarmac, but you will also have the pleasure of pocketing a little extra greenback through the year. *Note, the discount is not offered by all insurance companies. Please check with your provider to see if you qualify for this extra savings. Kuls' Car Care Tips: Your rights! In an Accident? Do you know your rights when it comes to dealing with the insurance companies? Here are the answers to a couple common questions. 1 - Do I have the right to select the shop that will repair my car? Yes... this will help expedite your claim. Your insurance company may say that you have to have your car repaired at one of their "preferred shops" but you have the right to choose the repair shop you would like to go to. Just remember that you must notify your insurance company of your accident. 2 - Do I need to get 3 estimates? You can, if you want but no, you do not HAVE to get 3 estimates. Obtaining those estimates takes time and money (to tow from shop to shop). As mentioned above, you have the right to have your car repaired wherever you choose. As long as your insurance company approves the estimate, you may have your vehicle repaired at the repair shop of your choice. In case of an accident, the main priority is that you are safe and healthy. Second to that is your vehicle. Be sure to deal with a repair shop you know and trust. You should never have to yell at or argue with your insurance company. Be polite and respectful and they will deal with you the same way. But hopefully you never need to use this advice. Happy Driving and Merry Christmas! Often a vehicle gets a makeover and there is really not much change. With that said, the All New 2015 Toyota Camry is just that. All NEW. And this iteration is truly a step up! This last week, the vehicle arrived on our lot - creating immediate buzz among our team (and excitement with me). Getting in the vehicle, expectations were not simply met; they were blown away. I quickly jumped into one and took it for a ride. At times I kind of felt like a kid at the candy store - getting to sample as much as I wanted! This new Camry takes all that was good with past models and adds to and improves on it. It's wider, athletic stance improves stability and handling, while also subtly increasing cabin space (in what was previously a spacious interior). It's aggressive lines shatter the old stereotype of being a "conservative" vehicle, however the drive boasts just the right balance between "aggressive sporty" and "smooth luxury". With standard features like "Display Audio with Bluetooth, Air Conditioning, Backup Camera, enhanced Audio with USB input (and a 6.1" display), Keyless Entry and Toyota's STAR SAFETY SYSTEM", this Camry is literally ready to drive away. As in the past, both 4-cylinder and 6-cylinder options are available. Additional features leave nothing to desire and include in-console wireless charging, XM satellite radio, Power Seats, Leather, Alloy Rims, and much more! And starting at only $23,850 (plus freight and PDI), it is a Great Deal! Not to mention the fact that some models actually dropped in price! Feel free to book a test drive OR just drop by and take one for a spin. Lloyd is the New Vehicle Sales Manager at Stouffville Toyota. With the fall and winter season, comes frigid temperatures. What do you do when you go outside in the cold? You dress warm, winter coat, hat, mitts, etc. Washer Fluid: Yes, you need it all year round, but come winter, it is especially important to use a fluid that will not freeze. As the roads get covered in that slush, salt and dirt mix, the ability to clear your windshield becomes paramount. Engine Coolant: But won't my engine stay cool in the winter? Well yes it will - but too cool! You see, engine coolant doesn't just keep your engine cool. It also helps prevent rust and corrosion in the radiator, engine and heating block (all important in the winter months). Make sure the level is good and the fluid is not too old - how do you tell that? By the color. Good Coolant generally looks yellow-ish or orang'y. If it is brownish in color, it is likely not working anymore and needs to be flushed and replaced. Engine Oil: Your engine oil keeps your motor alive. Sort of like blood to humans (ok, not quite, I know). Keeping it fresh and clean is extremely important. After all, your vehicle's engine is sort of like a war zone - with hundreds of explosions going off each second. The engine oil keeps it clean, reduced the heat and allows all the parts to move properly. If you are not sure about your fluids, feel free to book an appointment with our amazing service department. They are always happy to help you out. You can also watch our head technician demonstrate how to check your fluids here. Let's face it; new drivers face a steep learning curve. As a parent, I want my kids to succeed. I want them to be safe, I want them to learn and grow. When I started driving, ABS brakes were not yet standard on vehicles. Today, technology has advanced dramatically. Here are 5 innovations to look for when putting your new driver behind the wheel. 1 - Blind Spot Monitoring: Despite multiple design innovations, vehicles continue to suffer from the "blind spot". Each year, there are more than 800,000 blind spot related accidents in the US. This technology displays a small light on the side-view mirror to indicate another vehicle in your blind spot. I can't think of a new driver that would not love this. 2 - Vehicle Stability Control (VSC): The Insurance Institute for Highway Safety estimates that if every vehicle on the road had VSC, fatal accidents would be reduced by 10,000 per year. Think about it. A new driver hits a patch of black ice and begins to slide. What do they do?? Not to Fear!!! With VSC, your vehicle takes over, helping to stop the slide and keep your vehicle on the road. 3 - Lane Departure: Lane departure technology will beep if the vehicle is drifting out of it's lane. This is very helpful to the new driver who can often be burdened with sensory overload. It can also help with the experienced driver caught looking at the beautiful scenery. 4 - Back Up Camera: Yes, you can simply look behind you, however you can't always see the child playing on the sidewalk. A backup camera will assist with this - displaying exactly what is behind you, along with a grid showing where you are heading. Very helpful to the new and experienced driver. 5 - Parking Sonar: One of the biggest issues new drivers have is adjusting to the size of the vehicle they control. The technology acts as it sounds - beeping faster as you get closer to another object or vehicle. This will greatly reduce the scratches, dings and headaches associated with parking just about anywhere! So as you head out to purchase you next vehicle, consider checking out these great innovations. Whether it's for a new driver or seasoned vet, they sure can help keep you and your loved ones safe on the road. Wheel (or tire) balancing, is the process of equalizing the tire and wheel assembly weight. It is done to ensure the wheel spins smoothly at high speeds. No, not all wheel assemblies weigh the same. Sometimes they can be different by several ounces!! As a matter of fact, industry experts say that when driving at 100km/h, only 6 ounces out of balance will subject your wheel to a pounding force of 60lbs! Even half an ounce out of balance is enough to cause vibrations and noise problems with your vehicle. So what's the problem with a little vibration? Well, it could be a lot. For starters, there is the discomfort of driving with vibrations coming through the steering wheel or seat. Further to that, the vibrations can actually cause stresses and strains on the wheel bearings and suspension components. And the vibrations coming through the steering wheel can also cause damage to the components in the steering column. And who likes to spend more on fuel? Not us. Unbalanced wheels often cause a vehicle to consume more energy then would be needed if running properly. But how do you recognize a problem? 1 - You will likely feel vibrations through your hands and seat. This will increase in intensity as you hit highway speeds. Typically, vibrations through your hands indicate unbalanced front wheels, while vibrations in your seat indicate rear wheel balancing problems. 2 - You may hear a subtle humming or buzzing noise when traveling at highway speeds. This generally accompanies the vibrations. 3 - Your tires may show unusual wear patterns, often appearing scalloped or cupped with additional wear on the edges of the tire. Normal wear patterns tend to cover the entire tire surface on a somewhat regular basis. If you think you may have an issue, don't wait. The fix is quick and simple, and will save you more money in the long run. Call your trusted local dealer and schedule an appointment today. So it's that time of year again. The time that parents celebrate and kids drag their feet. It's the end of summer vacation!! Along with it comes big yellow buses, orange clad crossing guards, masses of children walking to school and police radar & safety stops. There are some things you can do to help navigate the maze of street chaos that inundates us. 1 - Be Patient. Yep. Real Simple. If you are patient, you will likely be paying closer attention to the road and vehicle surroundings. When you rush, you are more likely to miss a sign, roll through a stop or drive too fast - especially in a school zone. Try getting up 10 minutes early, and leaving some extra time so you are not rushing to work. In the end, you'll not only save yourself money (from possible tickets), but could also save a kid's life. 2 - Respect the school bus. Did you know more kids are killed getting on or off a school bus than are killed as bus passengers each year? Make sure you leave space and ALWAYS stop when the bus puts it's signals on. You can also be courteous and let them in when changing lanes. Allowing a bus driver to relax a little and can relax and deliver the kids safely will go a long way. Because let's face it, how would you drive with 40 loud and energetic kids in your vehicle? That's what I thought. The bottom line is that you should always be patient, courteous and respectful of other drivers, pedestrians and yourself. It's a year round thing, not just for the beginning of September. When Paul's not at the dealership you can find him... wait, he's always in his office. Every year about this time, I'm reminded of how quickly things can change. I begin to see leaves showing signs of red, yellow and orange, kids head back to school and another summer has past. You see, like many new vehicle buyers, I too am a father. And every year, there are things that need to be changed or replaced. Usually they have aged, worn out or been outgrown. But occasionally, it's because we didn't think ahead when making the initial purchase. This also rings true when you consider your next vehicle purchase. If you are like many people, you will plan to keep your vehicle for a number of years. You definitely want to look ahead and consider where you expect to be and what you expect to be doing. If you are a young couple, you should ask yourself; in the next five years, do we expect to have children? Will we need the vehicle for work? Does it fit our lifestyle? (City living could mean a smaller vehicle vs. sub-urban living where a full size could be an option). If you are nearing retirement age, what do you plan on doing? Will you need space for grandchildren? Or fuel economy for long road trips? So before you come by to select your next vehicle, be sure to make a mental checklist and share it with your vehicle consultant. The more they know about your needs, the better they can help you find the perfect vehicle. Lloyd is happily married with fantastic growing children. He loves taking a scenic drive through the fall colors in and around Stouffville. The summer is a great time, a time to hit the open road and find new adventure. A time where the days are sunny & hot and the nights are warm and peaceful. A time to kick back and relax - because after all, what can happen to my vehicle when the weather is so good? Well, that wonderful, earth-warming sun can actually do quite a number on your vehicle (along with the UV Rays it delivers). Understand, technology has come along way and manufacturers are constantly getting better. With that said, there are still things you can do to keep your vehicle from ageing earlier than it should. 1 - Park in the Shade! This simple act will do more than protect your vehicle's paint from fading, but it will also mitigate the temperatures - lets face it, who really likes to get into a 40 degree C vehicle? Not me. 2 - Use a Sun Shade or have your windows tinted. Although sunshades are not the most attractive product, they are effective in blocking the harmful UV Rays. Thankfully, they do fold up and can easily be tucked under a seat. Alternately, you could have your windows tinted; a good tint job will also provide protection and is hassle free. 3 - Fabric/Leather protection - Yep, they actually do help. Make sure your application covers every inch of your seats and dash. A good protector will help prevent sun stains, drying out of leather or fading. 4 - Make sure your fluids are topped up. Hot summers can cause some fluids to drop. Be sure to check your coolant and battery on a regular basis. Keeping the fluids topped up and the battery strong means less stress on the engine as a whole. If you are unsure about any of these steps, feel free to stop by your local dealership where they should be more than happy to help you out. To test if your "sun-proofing" is working, clean your vehicles windshield (inside). After a few days, wipe a clean finger - if you see an oily smear mark, the sun is getting through your defences and pulling the oils out of your fabric, leather and interior finishes. Kuls is the Operations and Service Manager at Stouffville Toyota. He has been in the industry for more than he'd like to admit, but has never been happier than here at Stouffville Toyota. Making Money from a lease? Yes you can! Leasing a new vehicle definitely has some pro's and con's, depending on your needs and situation. Previously we explored the Top 5 Reasons a Lease is right for you, but today we are taking a look at a leasing secret that some dealers don't even offer!!! Toyota's UNADVERTISIED MULTIPLE SECURITY DEPOSIT PROGRAM (MSD program) can net you reduced interest rates and reduced monthly payments without having to put down a non-refundable deposit. Here's how it works. With Toyota, you can leave up to 9 additional security deposits. Not talking about a down payment here. Typically a security deposit is taken and held for the term of the lease. When the vehicle is returned to the dealership, the security deposit is refunded (assuming the vehicle was in good condition and within the allotted KM's). With the MSD program, each additional security deposit you leave reduces your interest rate, thus reducing the monthly payments. Then at the end of your lease term, the security deposit is handed back to you! Monthly Savings $20.84/month for 60 months. That is 8.33% return on your investment and it is all tax-free. Compare it to what you would receive at the bank -2.5% - $375 over the term. So if you are in the market to lease a vehicle, why not take advantage of a wise investment opportunity while you are at it!! Make sure you ask about the Toyota MSD program. Kevin is the dealer principal at Stouffville Toyota. You may have met him at the strawberry festival last weekend, enjoying the sun and talking with lots of great people (and occasionally sneaking into the bouncy castle!). So I may not be your typical Toyota Prius owner. I don't necessarily have a "green thumb" (although I do really like gardening). I'm a typical lady. I have a moderate commute to work - about 25 km each way and carry a large, overloaded purse everywhere I go. When it was time to decide on a new vehicle, I chose the Toyota Prius lift back. Why you ask? Oh there are soooo many reasons. As a lady with a large (and often overloaded) purse, the "Smart Key" is essential. As I approach my Prius...it unlocks! No more digging for my keys!! This makes me oh so happy. Even when I get in, there is no digging for my keys. I simply push the "start" button and vroooom, I'm ready to roll. What about locking it you say? No problem. I simply touch the handle when I exit and the vehicle locks itself - safe and sound. But this is only the beginning. The back up camera is wonderful. Really, have you ever tried to back out of a spot at a garden centre in the spring?? I think it's worse than Christmas at the Mall! Speaking of shopping, the Prius Lift back has loads of space - allowing me to buy and transport even more plants without the risk of damaging or crushing them. On top of that, the height of the vehicle makes it incredibly easy to load and unload. Finally the obvious feature of driving a Toyota Prius - the exceptional Fuel mileage and low Carbon Footprint. I mean really, did you see the price of unleaded fuel in Stouffville this past weekend? It was over $1.43/litre!!! That makes getting 3.7/100km quite desirable! The Prius isn't only great looking and fun to drive, it's also incredibly practical, and GREEN - like Stouffville Toyota. Come by and check yours out today. Recently we hosted Ladies Night, an evening designed specifically to serve women in and around the Stouffville area. As I drove home after the event, my phone rang - where was my Bluetooth? I realized I did not have it, and thus pulled over, called back and then proceeded with my journey home. Why do I mention this? Well, although it is illegal to use a handheld device when driving, I never fully realized why, until that night. You see, Jen Baxter (our wonderful Event Manager) invited the Whitchurch-Stouffville Police and Fire Departments. They made an incredibly effective safety presentation regarding handheld devices and distracted driving. They didn't just speak, they demonstrated. They showed us just how easy an accident could happen when you drive distracted; texting or talking on your phone. 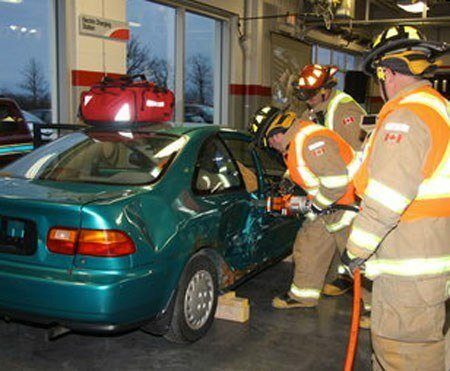 It was something I'd heard before, but until they presented and demonstrated how they extract a victim from a smashed vehicle (using the Jaws of Life), I did not fully grasp the importance. Like you, I have a lot to live for - a loving wife, great children, good friends, just to name a few. Each relationship, each reason is far more important than responding immediately to a text or phone call - even if it is "urgent". You can always pull off the road, park and call back. Thank you to our Police and Fire services. You gave a presentation I will never forget. This is an event we've done for the past 3 years (since we opened), and each year we've had different guests and themes - as well as prizes, food and drinks! This year, we had more of a focus on road safety as we welcomed the Whitchurch-Stouffville Police and Fire Departments as well as the Car Lady and also heard form our service technicians. Tips for the first time vehicle buyer - and the vet! You've decided, it's time to buy a vehicle. That was the easy part. Now the process begins. But don't worry; buying a car today is not like it was 20 or 30 years ago! There are many checks and balances in place to protect the consumer (although that's another blog!). Today, we are looking at some key points to remember. Things that will make the car buying experience easier for you, your family and friends! 1 - Consider your credit history, and determine a budget you can afford. Most people buying a vehicle do not have the cash to make an outright purchase. One of the most important things is to buy (or lease) what you can afford. 2 - Determine what you NEED in a vehicle and what you WANT in a vehicle. The key role of our sales consultants is to help guests select the vehicle that best suits their needs. Having an idea of these criteria ahead of time will help the product consultant show you the correct vehicles and will often save you a lot of time and headaches. 3 - Do some online research to get an idea of the vehicles that could be right for you. In today's day and age there is an enormous amount of information at your fingertips online. Manufacturer's list vehicle models, trim levels, accessories, and pricing on their websites. Similarly, some dealerships (like ours) will list their current new and pre-owned inventory online so that the consumer has a clear idea of what is available for purchase. Further to that, there are plenty of product reviews on the web! 4 - Research the dealers - sometimes it will be more beneficial for you to drive 30 minutes to work with a dealer that truly cares about your needs and offers excellent customer service (Stouffville Toyota's shameless plug - we were recently won Toyota's highest award for customer service - the Pinnacle Award!). Take a look at available customer feedback (Google and Mobials are good places to look). This will give you an unbiased view of the dealer and sales associates. 5 - Drive the vehicles that interest you. There is nothing quite like test driving a perspective vehicle. I would go so far as to say that driving the vehicle is the most important part of a car buying process for the consumer because it qualifies a particular vehicle as one which meets your needs or does not. Kevin is a longtime resident of Markham, ON. He has been in the auto industry for... a while. If you have more questions, feel free to call or drop by the dealership. Last year, automobile theft cost Canadians and insurance companies over half a billion dollars to replace or repair stolen vehicles. Here are some tips on how to reduce the risk of your vehicle being stolen. ALWAYS LOCK YOUR VEHICLE Lock your doors is not enough. You must also close your windows, sunroof and yes, if you have a convertible - put the top up. I know the weather is getting really warm, but it only takes a few minutes to cool a vehicle once the AC is turned on. The reality is, a thief only requires a small opening in a window to drive your vehicle away. Once locked, please take your keys with you. Leaving them on the roof or trunk does you no good. DRIVEWAY THEFTS Never leave your vehicle running and unattended. Professional auto thieves look for this exact scenario, especially in the winter, when people opt to let their cars warm up unattended. TURN YOUR VEHICLE OFF Vehicles left running are often stolen at ATMs, convenience stores, coffee shops, etc. It can happen that fast! HIDDEN KEYS Avoid hiding a second set of keys in or on your car. Thieves know all the hiding places. Keep that emergency key in your wallet or purse instead. HIDE VALUABLES Do not invite auto break-ins by leaving valuables in plain view. Items left in the open attract thieves. Also keep in mind, that the trunk of your vehicle may be accessible if your vehicle has rear folding seats. MIND WHERE YOU PARK Park your vehicle in well-lit areas as close to main buildings and pedestrian traffic as possible. Avoid that out of way the parking spot. If you have to leave your vehicle parked for an extended period of time, select a lot that has security and attendants. It may cost a little more, but it's worth it. Debunking 5 Myths About Hybrid Vehicles! As fuel costs continue to rise and our need for transport continues to remain constant, fuel efficiency becomes and ever important consideration when buying a vehicle. Let's face it, everyone likes to save money! One of the easiest ways is to drive a car or truck that is fuel-efficient. But fuel efficiency is no longer dependent on traditional "fuel" consumption. There are now alternatives, "hybrids" as they are called. With new technology, there are often myths. Here are the 5 top myths that enshroud "hybrid vehicles". 1 - Hybrids lack power This may have been true of the earliest models but Toyota and Lexus have been building and developing Hybrids for over 16 years! Current models have as much or more juice as their gas powered brethren. Consider the 2008 Lexus GS 450h, it can accelerate from 0-100 kms/hr in just 5.2 seconds!! 2 - Hybrids are expensive Yes, it's true of the older hybrid models but today a 2014 Toyota Camry hybrid starts at just $27,745.00 (plus freight PDI and HST). Compare this to 2008 when the same Camry cost $32,000.00 (plus freight PDI and HST). 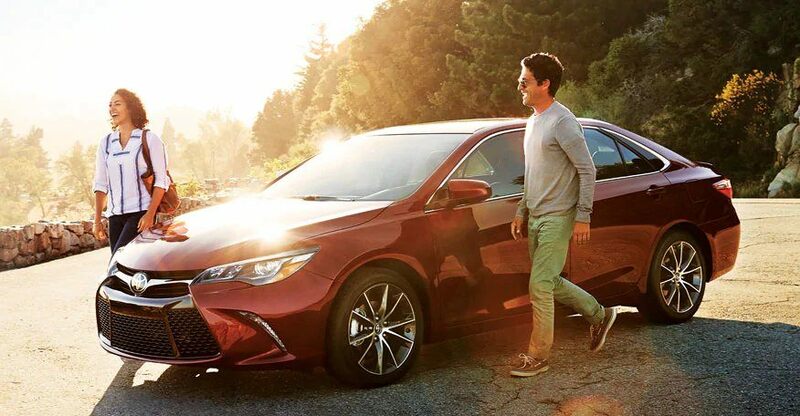 Now look at the fuel efficiency you gain with a Camry Hybrid. A gas powered Camry gets an impressive 28 mpg while the Camry Hybrid achieves 41 mpg! Over the course of a year, this works out to between $750 and $1000 of savings for you! 3 - Hybrids need to be plugged in This is a common myth; it actually confuses hybrids with electric cars. Electric cars do need a plug in station or a home kit to be charged for power, and their range is therefore limited. Hybrid cars and trucks use a mechanism known as 'regenerative braking' to charge their batteries - essentially transforming the cars deceleration into electrical energy that is then stored in the battery! Meaning you get to drive like normal, filling at standard petrol stations - just less frequently! 4 - All hybrids have great fuel efficiency While hybrids get better mileage that their gas only counterparts some models boast better fuel efficiency than others. For example the Highlander Hybrid gets 27 mpg compared to several other vehicles in it's class getting only 20 mpg. 5 - Hybrid batteries have a short lifespan and are expensive to replace It is true, that the nickel-metal hydride batteries used in current generations of hybrid vehicles are a few thousand dollars to replace. However most manufactures (including Toyota) warranty their batteries for 8-10 years or 160,000kms. Since we (Stouffville Toyota) opened 4 years ago, we have never replaced a hybrid battery! Have a safe and fuel efficient Spring! 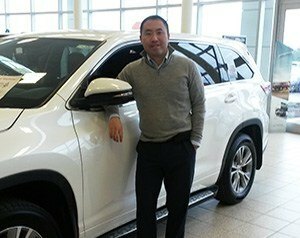 Lloyd is the New Vehicle Sales Manager at Stouffville Toyota. When not working he can be found renovating his bathroom - don't worry, he has a second one that is functioning. We've all been there, standing at the dealership, looking at the shiny new car. You are about to get in and take it for a test drive...but you are no mechanic and have no clue what to look for. Here are 7 tips to help you make the best vehicle decision and maximize your test drive experience. 1 - Braking: First off, do they stop you. Second, how do they handle quick and abrupt stops? Try soft, then hard braking in succession to see how it responds. Make sure they slow you in a straight and controlled fashion. Above all, please warn your passengers before doing any brake tests! 2 - Acceleration: Test it out. Try accelerating on the highway; is there enough torque there? Is the acceleration adequate and suitable for your needs? Try turning on the air conditioning when testing this out - how does it change? 3 - Ride Quality: You should drive the vehicle on a number of surfaces and road types. Windy roads, hills & highways are all great places to "feel" the vehicle. How does it handle the bumps? How about the corners? Does it climb the hills well? Are there any odd vibrations or noises when you go over bumps? 4 - Handling: Try a wide variety of turns - wide, short, fast, slow, etc. Does the vehicle handle them well? Does it respond immediately? Are you comfortable making quick maneuvers and do you trust the vehicle? 5 - Transmission: With Manual transmission vehicles look for a smooth clutch and shifter. Do they feel easy to use? With Automatic vehicles, pay attention to the upshifts and downshifts - does it feel smooth and easy? Are there any clunks or off shifts? The transmission should be smooth and really just about unnoticeable. 6 - Noise: Engine noise, wind noise, road noise and interior noise. Listen with the windows up and the windows down. Try having a phone conversation while driving (on your Bluetooth of course) OR a conversation with a passenger - are you having to yell or turn up the volume? Listen to see if there are any odd sounds or noises. 7 - Parking: How many times have you gone to a store to find a driver has taken two spots because they simply cannot park their vehicle. Parking is integral to your life with your ride. Try parking forward and backing in. Then try parallel parking. You should be able to do all three with ease. When you are parking, consider the sightlines - how well can you see your surroundings. Buying a vehicle can be a daunting task, especially when you are considering buying pre owned. Unlike new, there are several unique things to consider when making this decision - one which has it's own unique advantages. Here are the top 6 tips to help you find a great pre-owned vehicle - designed to reduce the risks and to help you make a better more informed decision. 1 - KNOW WHO YOU ARE BUYING FROM Let's face it, you wouldn't buy a steak dinner from McDonalds, so why buy a vehicle from a less than reputable place? Registered Dealers will not only check, service and warranty the vehicle they sell, but they will also provide finance options, lien checks, vehicle history disclosure and an avenue of recourse (in the case of an issue). 2 - VEHICLE HISTORY Ask the seller to provide as much background information as possible on the vehicle that you are considering to purchase. Vehicle history reports, previous owner disclosures, and accessible service history should be made available to all prospective buyers. If the seller does not want to provide this or says their word is good - WALK AWAY. 3 - RECONDITIONING AND WARRANTY Is the vehicle being sold certified and e-tested? Various manufacturers offer Pre-Owned Certified Programs available at New Car Dealerships. They generally include a more rigorous mechanical inspection, a powertrain warranty and a higher standard of reconditioning. Ask to see what work has been performed and what type of warranty is included and or available. 4 - TEST DRIVE Without doubt, one of the most important steps in a vehicle purchase is the visual inspection (paint, interior, engine, tires, glass, etc. ), followed by a thorough test drive. Take the vehicle for an extended drive over various road conditions to get a true feel for the vehicle. This includes highway driving, in town situations and if possible a bumpy road. Does it brake properly? Is the suspension noisy? How is the acceleration? Does the heat and AC function properly? Does the vehicle feel comfortable? Does it fulfill your needs? 5 - PRICE Try not to let price dictate your buying decision. A lower price may not necessarily represent a better deal when considering a used vehicle purchase. Paying a little more for a used vehicle that has been loved and regularly maintained can mean reliability long term. 6 - NEGOTIATION Be fair to yourself, but also be fair to the dealership. Contrary to popular belief, profit margins in most cases are marginal. Today's automotive retail market is very competitive and dealer's will advertise their vehicles aggressively to compete. Some dealer's subscribe to Market Based Value Pricing. The focus should be to select a Quality Used Vehicle that best suits your needs and Budget. Paul is the Pre-Owned Vehicle Manager at Stouffville Toyota. He is thrilled the winter is over and is ready for a long sunny summer. Not long ago, I was driving into the dealership when I caught up with a great looking Toyota Tundra (no, I was not speeding!). I noticed it's taillight was out which is a big safety concern. At the next set of lights, I pulled alongside and informed him of the problem. Since we were very close to Stouffville Toyota, I invited him to follow me in and offered to take care of him immediately. With a look of surprise on his face, he thanked me and followed me to the dealership. When we arrived, I escorted him to our lounge area and got him a coffee and butter tart. Immediately we repaired the light, 10 minutes later he was on his way, safely down the road. Step forward to last month. It is a cold, but sunny day. Our entire service department is tired of the long, harsh winter and ready to leave it behind. It was one of those days where you are happy, but could use a little pick up. Late afternoon rolls around. As usual, there are customers coming in and out on a regular basis. I was busy finishing up some paperwork, when I hear a knock at my door. I looked up, before me stood a tall gentleman holding a tray of Tim Horton's coffee and a box of donuts. He says, "Hi Kuls! Do you remember me?" I said "Of Course! How are you? What brings you in today?" (since he lived quite far away). He responded, "I came to pick up my Tundra. I brought it in early this morning to get it serviced, but you weren't in yet. I have some coffee and donuts to thank you and your staff for everything they did the last time I was here." He followed it by saying, "I will never forget that day. You notified me that my brake light was out. You took me to the dealership. You replaced the bulb in only 10 minutes AND even washed my truck. Not only that, I also enjoyed your coffee and butter tarts - all this for a price a light bulb!" He finished by saying something that meant more than the coffee and donuts. He stated (with a smile), "Kuls, you and your team have restored my faith in dealerships. Thank you!" You see, we did more than change a bulb that day. We made a friend, and in turn helped change both our outlooks on life and people. Yes, it is easier to drive away, but when we take a moment, something amazing happens. Relationships are built, trust is strengthened and our community is improved. So next time you see someone in need of assistance, no matter what type, take a moment to offer help. You may be surprised with what comes of it. Kuls has been with Stouffville Toyota since it opened in 2009. He always has a smile on his face and love a good joke! I'm a truck and SUV guy. Always have been. There is something about sitting higher and having a clear, unobstructed view of all that is happening around me (not to mention the go anywhere capabilities!). I look for a number of things when choosing my truck. Comfort, features, safety and style are all immediate considerations. Long term thought must also be given to quality, durability and resale value. Recently I decided on a 2014 Toyota Tundra Crew Max. Over the last years, I've driven every truck on the market and can say with absolute confidence that the Tundra is second to NONE. With the variable options and best resale value in its class (according to the Kelley Blue Book), the Tundra delivers. The great new design has resulted in a more aggressive exterior and a clean modern interior with improved content. 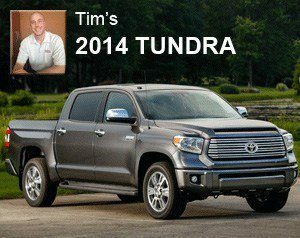 In fact, all of the new Tundra models include an enhanced touch screen audio system with integrated back up camera's - taking the guess work out of parking or hooking up a trailer. This touch screen also engages the Bluetooth features on the vehicle, displaying all of your contacts and dialing out with voice command - keeping your calls "hands free". One of my favourite features of the Crew Max model is the power rear window. With the push of a button the huge rear window seamlessly descends, adding a new dimension to warm weather driving! In as much as the Tundra has been re-designed, it is important to point out that Toyota has kept the proven and reliable engine and drive-train. A combination that puts out 381 horsepower and 401 lb-ft of torque (in the 5.7 litre V8), more than capable of hauling your boat to the lake or a trailer of material to your jobsite - all in what feels like a luxury interior. Overall, Toyota delivers a huge dose of quality, reliability and safety, complimented with a superb style and dynamic features. And let's not forget, this Tundra is built in North America. For those in the market for a new truck, make a point of getting behind the wheel of a Tundra before making your decision. We have a variety of models and colors in stock at Stouffville Toyota and would be happy to help you experience the truck for yourself. Tim has been with Stouffville Toyota since they opened in September 2010. 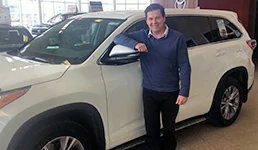 He has been the top sales professional the past three years and recently received the Toyota Pinnacle award for customer service. When he's not assisting customers you'll likely find this Stouffville resident out on the links. Safety, The Unknown But Vital Features That Surround You! I'm a Father of three wonderful kids. I love them more than anything. As every parent knows, keeping your children safe is of utmost importance. Whether it's teaching them to keep fingers out of wall outlets, not to eat coins or to avoid strangers, we are constantly watching out for our kids. Often, this safety watch is overlooked when we get in our vehicle. Sure, we know there are safety features (seat belts, ABS, ETC, etc), but what the heck do they do? Why do they do what they do? Although I work in the auto industry, I never actually gave much thought to this... until I needed the features. I was driving - like every other day - when suddenly, someone slammed into me! Immediately the side curtain and front airbags deployed, preventing my head and body from impacting the window and steering wheel. The vehicles crumple zones engaged, absorbing some of the impact and easing the stress on my unsuspecting body. These are both features we do not see when looking at or driving our vehicles. They are also the most important features - more important than the stereo, leather, power windows, etc. They do more than make our ride enjoyable, they make our ride safe. Today, I have the pleasure of working for the largest auto manufacturer in the world. A manufacturer that has developed some of the most advanced safety features available today. This means that when I'm out with my family, I can truly enjoy the peace of mind that comes with driving a Toyota. Knowing that the "Star Safety System" is there to cover us. That the VSC (Vehicle Stability Control) will help prevent slipping and loss of traction by reducing engine power and applying brake force to the wheels that need it. That the traction control will help maintain grip on the wet, icy, loose or uneven road surfaces by applying brake force to the spinning wheels. That these and other features will not only protect us in case of an accident, but they will also help keep our Rav 4 on the road (regardless of how much snow is out there). Now, if only Toyota could provide a radio station we ALL agree on! Top 5 Reasons A Lease Is Right For Your Next Vehicle! 1 - NO UPFRONT TAXES. Let's face it, nobody likes to pay taxes and nobody likes to pay more than they need to. With a Toyota lease, your taxes are paid on a monthly basis, which means you are NOT paying taxes on the interest (as is the case with a finance). 2 - GUARANTEED FUTURE VALUE. With all closed end leases, Toyota guarantees the end value of the vehicle. When your lease term concludes, you can rest easy as Toyota Financial Services has already taken the risk on the vehicles value for you. 3 - GAP PROTECTION. In the case of a serious accident, when your leased vehicle is written off, Toyota Financial Services will absorb the difference between what is owed and what your insurance company is willing to pay out. A guarantee that assures you a little extra peace of mind. 4 - PROTECTION AGAINST DEPRECIATION. We all know that accidents often reduce the value of a vehicle. With a Toyota Lease, you have a safety net. In the case of an accident to your leased vehicle, simply have it repaired to Toyota standards and TFS will guarantee the value of your vehicle, effectively taking the loss for you. 5 - NO EARLY TERMINATION FEES. Contrary to what many believe, Toyota does NOT penalize you for exiting a lease agreement early. Simply pay out the balance of the lease and you are ready for your new vehicle! So before financing your next vehicle, consider a lease. It may actually be the better option for you. When I'm looking for a new vehicle there are three things I consider above all. Safety, Fuel Economy & Comfort. 1 - Safety. I'm not just a sales expert or great looking guy. I'm also a husband and a father. The best times of my life are with my family. That's why I look for this before any other feature in a vehicle. It was not long ago that I was driving my Toyota Venza. I was stopped in traffic when suddenly, a big domestic pick up truck plowed into the back of my Venza at more than 60km/hr!! What Toyota says about the safety of the vehicle is indeed true, as I walked away from that with little more than some shock and a very grateful heart. You can read more about the great safety ratings at the Insurance Institute for Highway Safety. 2 - Fuel Economy. With today's gas prices, it's hard not to consider this when purchasing a new vehicle. The Venza boasts more than 26 mpg on the highway and 19 mpg in the city (in the 6 cyl model - with a 3.5L engine and 268hp!). That certainly makes the drive to London, ON to pick up my son from University a little easier! 3 - Comfort. Let's face it. I'm a big guy. As a big guy, I need some space. And not just for myself (or all my son's stuff!). I need room in the back for the weekend away with the guys. I need comfort for that special night out with my wife. And this comfort does not only apply to the well equipped interior. It extends to the core of the vehicle. The Venza reaches highway speeds with ease, thanks to the 6 cylinder 268hp engine - almost making you feel like a race car driver! This is complimented by the independent suspension, giving the feeling that Ontario has the smoothest roads around. There are of course, several other things I love about the Venza. These include the 20" wheels (wheels make a car), the sleek design, excellent sightlines, extreme reliability and high resale value. Overall, the Venza is the Toyota for me - in the Blizzard Pearl color of course! Luciano is an auto professional and Whitchurch-Stouffville resident. He knows the Toyota lineup in and out and is more than happy to help you find your Toyota. You can reach him via email - luciano@stouffvilletoyota.ca or simply drop by the dealership. This time of year when road conditions are often frozen, salty and just plain harsh, it makes keeping your vehicle's exterior clean considerably more challenging, and important. Whether you live in a warm, cold or seasonal climate, keeping your car's exterior clean and protected is the best way to keep the vehicle looking great and free of unsightly corrosion for many years to come. While neglecting the paint job may not lead to mechanical performance issues, it will result in a lower resale value, just like neglecting regular services such as oil changes and tune ups. Generally speaking, people believe that a car that is an eyesore has been poorly maintained mechanically, making them less likely to offer top-dollar when you want to sell it or trade it in. Anyone who wants to maintain the value of their vehicle and keep it looking beautiful needs to protect its exterior, no matter the outside temperature. Bird droppings, wind, rain, hail, tree sap, smog, ultraviolet rays from the sun - you name it, there are a host of threats to your car's shiny finish and perceived value. If you live in an area with ice and snow, you may also have to deal with road salt. Salt is great for melting ice off the roads and clearing a path from your driveway to your front door, but it also gets used as a pre-treatment to prevent ice formation during warmer weather than you might expect. Unfortunately, it is also great at promoting rust and damaging vehicle paint. Thoroughly wash the exterior and undercarriage of your vehicle regularly to remove salt, slush and mud. A good coat of wax in the fall will help protect your vehicle's finish during the winter months as well. Aside from frequent cleanings, regular waxing is one of the best ways to protect your vehicle's finish because it helps preserve the oils in the paint that prevent the oxidative process that causes dulling. If water doesn't bead up nicely during your next car wash, then you likely need a new coat of wax. Winter debris can also damage your windshield wipers, and nothing is more important than your visibility as a driver. If your wipers are leaving behind streaks or making strange squealing or chattering noises, it's time to think about replacing them. "Drivers benefit from consistent wiper performance regardless of weather conditions for safe winter driving," states CAA. Check monthly to see if they are worn, cracked or rigid with age. Damaged wiper blades won't adequately remove debris, compromising the driver's vision and safety. You can also obtain special winter windshield wiper blades from your dealer, which are better equipped to stand up to the harsh conditions that winter brings, such as heavy snow, ice and debris. "The life of a wiper blade is typically about six to 12 months," says CAA. "And keeping your wiper fluid filled up is also a plus, as fluid can assist in breaking up snow and ice on the windshield. If you live where it gets cold, using fluid formulated for lower temperatures will prevent washer freeze-up." All it takes is a little bit of extra attention in order to keep your car protected and looking beautiful. Proper preventive maintenance can extend the life of your vehicle, keep it looking great and most importantly, help prevent costly repairs. Head in to the dealership and let the experts prepare your vehicle's exterior for winter weather today. Nobody enjoys getting into a cold vehicle on a chilly morning. You appreciate your vehicle's heating system most during those first cold minutes of your journey, when your breath is frosty and you have to try to adjust the radio knobs while wearing gloves. When the heat kicks on and begins warming your hands and toes, you realize how essential it is. So make sure you always have heat when you want it by scheduling a service appointment to ensure everything is working properly. Heat in the winter is obviously important for your comfort but the issues related to safety are equally important. Never warm up a vehicle in an enclosed area, such as a garage according to the experts. This is important to keep in mind because the cold weather can tempt people to warm up their vehicles before they leave the comfort of the garage. It is far better to get into a chilly car than to risk the health of yourself or a family member, so don't risk the dangers associated with the build-up of exhaust fumes that can result from running your car in an improperly ventilated space. In addition, at this time of year the roads can often be hazardous. If they are covered in ice or snow and you become stranded or get into a collision, you will need your heating system in working order while you wait for help to arrive. "When vehicles are not properly prepared for winter, driving can be more stressful and treacherous," states Be Car Care Aware, a public service announcement (PSA) organized by Car Care Canada. It is recommended that you have both your heater and defroster checked professionally before driving in winter weather, as extreme weather magnifies existing problems with your car. So, if you still haven't booked a pre-winter performance check for yours yet, make sure scheduling one is at the top of your to-do list. As the Canadian Automotive Association (CAA) notes, making sure that your thermostat is in proper working order will also ensure that your heating system will work efficiently, so that you're happy and safe when the temperature dips. According to the CAA, winter storms are known to be deceptively dangerous because they increase the risk of skidding and losing control of your vehicle. Experts explain that traffic collisions and exposure to the cold can be some of the most dangerous aspects of inclement winter weather. That is why it is especially important to make sure your vehicle is ready for winter. In the event that you find yourself stranded or stuck in a snow bank, stay calm. CAA recommends that you avoid doing any heavy lifting or shovelling in the extreme cold. Ensure that your tailpipe is not blocked and then, if it's safe to do so, stay in your vehicle until help arrives. The cold weather is here, but fortunately your dealership can help you make sure that you will be warm and comfortable whenever you venture out in your vehicle. The holiday season is rapidly approaching. For those who are relying on their cars to get them safely from point A to point B and beyond, here are some tips and suggestions to help ensure your travel plans go off without a hitch. Before you leave, it's most important to make sure your car is in peak condition. That includes making sure all your lights (front, rear, brake, reverse, fog, turn signal and interior) are working. Your windshield should be clean and have no visible cracks, and your windshield wipers should be streak free and working properly. Make sure your windshield washer fluid reservoir is full, too. Regardless of how far your journey will take you, your brakes are going to get a work out so make sure there's no grinding, squeaking or squealing. Your tires should be inflated to the proper tire pressure (see your owner's manual or the door jamb of your car for proper air pressure) and should have good tread left. If you have any doubts, be sure to see a professional. If your tires haven't been rotated in a while, have it done before you leave. Any tire balancing or wheel alignment necessary can be done at the same time to minimize uneven wear and extend the life of your tires. Be sure to have any equipment that may be necessary along your route or at your destination, like tire changes if travelling in the mountains, a bag of kitty litter or sand if you may encounter snow or ice, etc. A couple of flares, a flashlight and some extra batteries are always useful. It's best to check your oil and other fluid levels, even if you've had an oil change recently. If any seem low, it's best to stop by the dealership and let the service techs see if there's any issue. While you're there, ask them to check all hoses, belts and other issues like noises or smells that may concern you. If you need to have anything replaced, the dealership experts will likely have the necessary parts on hand and know your car better than anyone else. The Canadian Automobile Association recommends that you be alert, well rested and always wear your seatbelt. If you have a Smartphone, using apps such as Waze and Traffic Canada can help to keep your travel times to a minimum, but keeping an old-fashioned map handy is always a smart backup plan. One of the best ways to ensure safe and uneventful travels is to bring your vehicle into the dealership so the trained technicians who know your car best can make sure it is ready for the road. With fall in full swing and winter creeping up, it's time to head to the dealership to check up on some of the things you've been putting off and to make sure your car is ready for whatever winter brings. Battery and Charging System: A fully charged battery can be the difference between getting to work on time and being stuck in your driveway or out in the cold someplace. Your dealer's service technicians know what to look for and will make sure your battery is ready or give you options if a new one is necessary. Drive Belts and Engine Hoses:Frayed or cracked belts should be replaced. Leaks and loose hoses also require repair. Tires and Tread: When temperatures dip below 7 degrees C, the rubber in the tires loses its ability to function properly, and that is also the case with "all season" tires. Switching to winter tires is recommended. In colder regions, the specially formulated tread rubber of winter tires ensures the best possible traction and handling. Tread depth of less than 3/32 of an inch (or around 2.4 mm) isn't recommended, and neglecting this can lead to further issues down the road. Keep in mind that tire pressure also goes down as the temperatures get colder, so look on the inside of the door jamb for proper tire pressure levels and insure your tires are properly inflated. Factory trained service professionals can answer your questions and make recommendations specific to your make and model of vehicle. Lights: Make sure your turn signals, head lamps, tail lamps, fog lamps and other lights are working properly. If a bulb is burned out, the right replacements are in stock to get you back on the road quickly. Wiper Blades / Washer Fluid:As simple as this sounds, being able to see when the weather gets messy is imperative. If you see streaks or spots on your windshield when it rains, you may want to get a new pair of wiper blades. Since they vary by car, simply stop by and a new pair that meets the specifications of your vehicle can be installed. Check your wiper fluid frequently and keep the fluid reservoir filled. Your dealer's service professionals will also check the fluid level and top if off if necessary when you are in for maintenance or repairs. Brakes:When the weather gets sloppy, your brakes play an even bigger role in occupant safety. Bring your car in to make sure all brake components are functioning properly. After a thorough inspection, any issues found will be brought to your attention and problems, if any, can be addressed. "As Canadians, it's essential that we take the necessary precautions to ensure that we and our vehicles are ready for the winter driving season," said Marc Brazeau, President of the Automotive Industries Association (AIA) of Canada. "Thinking and planning ahead can be the key to avoiding a roadside breakdown or a more dangerous situation." These are only a few of the items that need to be checked before you head out this winter. Stop by today for a full inspection to help ensure your car is running at its best and is ready for anything. Go beyond MPGs. Fuel efficiency gets all the love when it comes to eco-friendly vehicle ownership-and getting high miles per gallon is certainly important-but there are a number of other ways to reduce your car's impact on the environment. Making sure your fluids are recycled whenever they are changed, using environmentally-friendly fluids as replacements, recycling worn out auto parts and cleaning your vehicle without harmful chemicals all have a positive environmental impact. Every oil change is an opportunity to recycle used oil, and the same goes for antifreeze. Your local dealership and its automotive technicians are well-trained in all aspects of fluid recycling, but don't be afraid to ask about the procedures that matter most to you. Options keep popping up for engine oil and other fluids recycled from previously used oils, and they are just as effective as traditional fluids. Ask your dealer's service department about recycled products the next time you stop in for maintenance. The metal and plastics found in broken or worn out parts can also be recycled for use in other products, vehicular and otherwise. That way, they stay out of landfills. Don't hesitate to ask about any issues that may concern you. If you're the type to wash your car in the driveway, then you may as well make it a green car wash. Products like Simple Green's Biodegradable and Concentrated Car Wash product, Gliptone's Wash N Glow, and others, are effective and economical. Better yet, stop by the dealership and ask about the detailing and other services and products available to help your car look its best and run as well as possible. Adopting these measures on your own is significant, because as more people make environmentally-friendly car maintenance a habit, the impacts become greater and continue to grow. Stop by the Stouffville Toyota service department today - ask about the ways we help the environment, and let us know about the issues that concern you. Regular oil and filter changes are among the most affordable and at the same time most important, scheduled maintenance services you can do to keep your vehicle running reliably for many years. Without proper lubrication, the combustion engine becomes little more than an expensive boat anchor. Engines are made up of hundreds of moving parts that have to slide and spin against each other, and without a reliable supply of clean oil, those parts will grind to a halt before you get to the end of the block. In addition to its primary function of reducing friction between moving parts, engine oil also acts as an additional coolant to help take some of the combustion heat away from the cylinders. To properly do its job, oil has to flow freely through dozens of passages in the engine. The larger passages are cast into the cylinder block and heads, while many smaller ones are drilled into crankshafts and piston pins. While oil does help minimize wear of bearings and other metal parts, tiny metal particles eventually contaminate the oil over time. A mix of unburned fuel and exhaust gases can also slip past the piston rings, mixing with the oil and diluting it. If oil isn't changed according the vehicle's maintenance schedule, it will get thicker and turn into a sludge that can't do the intended job. The oil filter, which helps to remove dirt and other particles from the oil, will also get filled up over time. When that happens, the pressure increases and a bypass valve opens that lets unfiltered oil run through the engine. If this happens for an extended period, it can cause very expensive damage. Until about the mid-1990s, it was generally recommended that drivers get their oil and filter changed every three months or 5,000 kilometres. Since then, a number of technological improvements have allowed oil change intervals to be extended to 16,000 kilometres or more, depending on the make, model and powertrain of the vehicle. Driving style, frequency of towing, and weather and road conditions also play a big role in how often the engine oil in your vehicle should be changed, so you should check your owner's manual for guidance. Your dealer's service technicians are also a great resource for recommendations that are personalized for your particular vehicle and driving conditions. Oil formulations have improved, making oil more stable so that the thickness, or viscosity, doesn't change as much over time, and detergents added to oil help break down contamination from fuel and exhaust. New fully synthetic and synthetic blends reduce engine friction and improve fuel economy while lasting longer. Modern engine electronics also help to extend oil life. Most new engines have sensors that can detect the condition of the oil, and systems built into the electronic control unit monitor driving conditions. By keeping track of conditions like temperature, average speeds and engine loads, oil life monitors can determine if your vehicle is subjected to conditions that can accelerate oil break-down such as frequent or heavy towing, extreme heat, lots of stop-and-go driving, or if most of your driving is highway cruising. Vehicles equipped with oil life monitors provide an indication of oil condition in the instrument cluster and recommend when to get an oil change. Vehicles that are subjected to more stress might be recommended for an oil change every 5,000 to 8,000 kilometres, while those that see lighter duties might go a little more, saving money and time for the driver. Speaking of saving time and money, while it's not difficult to change oil yourself at home, the hassle of cleanup and properly disposing of the old oil (never dump it on the ground or in a sewer) can be avoided by having your oil changed by your dealer. As part of your dealer's oil and oil filter change service, service technicians will also lubricate key chassis components, top off fluids as necessary, inspect other vehicle systems and discuss with you any problems or questions you may have. A small investment in maintenance will keep your vehicle running reliably for many years to come, and will also save you money at the pump. One of the most important and yet neglected factors influencing the handling, and the fuel efficiency, of any car or truck is the wheel alignment. Your vehicle's ability to go, stop and change direction is affected by the direction each of the wheels is pointing, and, whether you drive a compact car or full-size SUV or pickup, the directional control you get where the rubber meets the road is important for safety. At any given moment only a small patch of rubber, often smaller than the palm of your hand, is supporting the weight of the vehicle and transmitting all of the forces from the engine, brakes and steering to the pavement. Proper wheel alignment helps ensure all of those forces are going where they belong and the tires aren't being overworked. While it may look to the naked eye like all of the tires are pointed straight ahead, they are all at slight but important angles. There are three different angles that affect wheel alignment: camber, caster and toe. 1 - "Camber" is the degree to which a wheel departs from vertical (or perpendicular with the road), as viewed from the front. The top of each wheel is usually angled slightly inward. On an average car or truck, the angle is usually less than a few degrees, and you need special measuring equipment to determine the angle. The camber angle compensates for the way tire rubber stretches and deforms when cornering, and helps to make sure that the tire's contact patch remains in full contact with the road, including while going around corners. 2 - "Toe" is the degree to which a wheel departs from being parallel to the other wheel on the same axle. If the front wheels (and the rears, if the vehicle has independent rear suspension) are angled slightly towards each other (as viewed from above), it's called "toe-in". "Toe-out" is when the wheels are pointing slightly away from each other. This is to counter the forces that push the wheels back into a more straight-ahead angle while driving. 3 - Finally, "caster" is the frontward or rearward angle that the steering pivot point has from vertical, as considered from the side. The forces from the caster angle are what give the steering wheel a self-centering capability when you go down the road or relax your grip after going around a corner. Each of these can be adjusted with links that are part of the suspension system. However, small variations in the angles can have a big effect on how the car drives and on tire wear. Sometimes hitting a big pothole or sliding into a curb can be enough to affect the toe or camber angle by a single degree or less, causing the vehicle to continuously pull in one direction or the other. In addition to causing the vehicle to pull in one direction or the other, alignment problems also cause abnormally high, often uneven, tire wear. This can lead to a blow-out that could cause an accident, excess vibration that can be felt throughout the vehicle and reduced tire life. Since checking and adjusting wheel alignment requires precision equipment, it should only be done by your dealer's service department. You should never attempt to adjust the alignment by hand at home. While most service facilities offer both front-wheel-only alignment and four-wheel alignment, it is usually best to go for four-wheel alignment. On rear-wheel drive cars and trucks with a solid rear axle, there usually aren't any adjustments available for the rear wheels. However, even in this case, four-wheel alignment is important because the front wheels will be adjusted relative to the rear wheels so that everything is pointed in the right direction. A front-only alignment can still leave the car pulling in one direction or the other. One way to determine if your vehicle needs an alignment is to drive it down a straight, flat road with little or no crown ((the fall-off toward the outer edge). The car should track straight ahead without you having to tug on the steering wheel. If the vehicle diverges from straight ahead without steering input, get it serviced soon. You should also do a regular visual inspection of all four tires for uneven wear. The tread depth should be relatively consistent. You can quickly check the depth using a penny stuck into the grooves. If the rubber in each groove covers the top part of The Queen's head, you have enough tread left. However, if the depth is significantly different on the inner or outer edge of the tire, you could have an alignment problem that needs to be corrected. Most alignment work can be done quickly and often doesn't require any replacement of parts unless the vehicle has hit something severe and bent a suspension link. A proper alignment and a regular tire rotation with each oil change will help your tires last longer and make your vehicle safer and more enjoyable to drive. In the heat of the summer, you may be cranking up the air-conditioning to stay comfortable, but don't forget about your four-legged pals - especially if they're spending a lot of time outdoors. Consider these five fun and easy ways to keep them cool and happy. 1 - H2O and treats. It may sound obvious, but your dog and other pets need access to plenty of fresh, cold water. On a really hot day, you might toss a few ice cubes into the bowl to keep the water even colder. There are also ice cream treats designed specifically for dogs, or you can find recipes online to make your own. Here's one clever idea - fill an ice cube tray with chicken broth or beef broth and then toss your dog a "pop" once the individual squares are frozen. 2 - Water play. Many dogs love to get wet, whether they are splashing in a stream, swimming in a lake or jumping into a kiddie pool in your backyard. You can also set up a sprinkler for them to run through. 3 - Check out new products. There are always new products on the market to keep pets cool in the heat, such as cooling bandanas and collars, pet beds that can be filled with cool water, and a collapsible water dish that you can carry anywhere - from a hike to a car ride. Keep in mind that if you're driving with your pet in the car, do not leave it waiting in the car for you, even if you crack the windows. Your pet's body temperature can rise quickly in a hot car and prove fatal. 4 - Limit activity in the middle of the day. If you're heading out for a walk or involving your pet in other outdoor activities, make sure to plan your excursion during cooler parts of the day (morning and early evening). The middle of the day is usually the hottest, and too much activity during this time can lead to an overheated pet. Pay attention to your pet's cues and seek the advice of a vet if it is exhibiting any health problems. 5 - Provide shade. If your pet stays outdoors, make sure he has a shady place to retreat when the heat becomes too intense. If you don't have any natural shade in your yard, consider getting a beach umbrella or invest in a doghouse. With a little bit of thought and preparation, you can prevent your pets from suffering in the summer sun. And they'll love you all the more for it. Vacations are a time to relax and let go of your worries, but that doesn't mean you can let down your guard when it comes to keeping your money safe. Tourists are often targets of pickpockets and crooks, but you can just as easily get into trouble if you lose your wallet yourself. Travelling safely means protecting your money but also having a good backup plan. Organizing your purse or wallet before a vacation makes it easier to travel safely. Remove the items you know you won't need, like your library card or local gym card. Bring only the essentials, including some cash or traveler's cheques, a major credit card, a backup credit card, your debit card and any insurance cards you may need. Leave your cheque book at home. Do your homework before travelling to another country to plan the money you will need. Unless you're visiting an area that mainly has a cash economy, stick to credit cards, debit cards and traveler's cheques to add a layer of protection. If you'll be using public transportation, buy a day pass to save money and keep your wallet safe in your purse or pocket. Using a reputable ATM locator, like those from Visa, MasterCard or your bank, will help you avoid fake ATMs set up by thieves. If you can't use a locator, choose ATMs in safe areas like airports, banks or hotels. Avoid machines in questionable areas or where locals are mingling too close for comfort. Pickpockets and identity thieves look for easy opportunities. To avoid being a target, keep an eye on your bags and belongings at all times, especially in the airport or when exiting a taxi at your hotel. Carry a cross-body purse with a zipper closure, or stow your wallet in a front pocket. If you carry a purse, keep one hand on the bag in crowded areas. Instead of keeping all of your money in your wallet or purse, divide it up in different pockets, or stow some in a money belt or bra stash. That way you won't lose everything if your wallet or purse is stolen. When travelling as a couple, also divide your money between each of you. If your hotel room has a safe, you can use it to store some of your money. Lock up the bulk of your money and a backup credit card at the beginning of your trip and only take what you need each day. Just be sure to lock the safe securely and check it each time you return to the hotel. Keeping your money safe on vacation lets you relax and enjoy your time away. If something does go wrong, having money stashed in other pockets or in the hotel safe will make it easier to recover from the loss. Packing real-life ruggedness through its body-on-frame architecture and decades' worth of off-road expertise, the Toyota 4Runner is entering the 2014 model year with numerous enhancements to make it better than ever. Introduced this spring to the public for the first time, the updated fifth-generation 4Runner is hitting dealer lots in the immediate future. Shoppers can expect a model that maintains the legendary off-road capability and toughness that have defined the 4Runner for generations, as well as added street-smart flare, athleticism and presence. Three trim grades allow for plenty of selection, with a value-driven SR-5 model starting the lineup, and both a luxurious 'Limited' model and a highly capable 'Trail' model available. For 2014, engineers and designers worked to create a 4Runner that is even more versatile, upscale and refined then last-year's model. Revised front fascia elements include a new grille, headlamps with projector lenses, and bumper inserts that convey more aggression and poise. New wheel designs and colour options round out the 2014 4Runner on the visual front. On board, enhanced use of soft-touch materials and leather wrapped accents create a more upscale atmosphere, and enhanced feature content builds additional value. Drivers will enjoy a new, high-quality 'Optitron' instrument cluster, featuring display technology with roots in high-end vehicles from Toyota's luxury brand, Lexus. Ventilated seats are now available on the 'Limited' model as well. Toyota offers the 4Runner in both two- and three-row configurations, with either 5 or 7 total seats, depending on the shopper's needs. The 2014 model year also sees the 4Runner fitted with advanced new multimedia systems, including advanced connectivity for Smartphones, USB drives and iPods or similar MP3 players. The famed 'party mode' audio setting intends to flood a tailgate party or campsite with music, and is still standard on all models. Getting owners to that party or campsite is the choice of part-time 4x4 or a full-time multi-mode 4x4 system with a locking centre differential. All models are equipped with a powerful 4.0-litre, 270 horsepower V6 engine teamed up with a five-speed ECT-i automatic transmission and transfer case four-wheel drive system. From that powerful basis, the 4Runner offers up a special "Crawl Control" system designed to enhance confidence and peace of mind for owners tackling the most challenging trails. Once the 4Runner's low-range final drive is engaged, Crawl Control can be activated to maintain a very slow 'crawl' across any terrain, whether its mud, ruts, rocks, climbing a steep grade or descending a slippery hillside. Regardless of incline or traction, the system takes full control of the throttle and braking to maintain the driver's pre-set speed, leaving drivers more attention to steer and navigate. Keeping with the 4Runner's off-road oriented capability, all models also feature a full-sized spare. Differential lock, sway-bar disconnect and other off-road systems are also available or standard, depending on the trim grade selected. Towing capacity is rated at nearly 2,270 kg. Further confidence comes from Toyota's STAR safety system, which is standard on all models and includes active technologies like Vehicle Stability Control (VSC), Traction Control (TRAC), and Smart Stop Technology (SST). The various features which comprise the STAR system all play a role in maintaining driver control in all situations. Few family-ready vehicles can match the 4Runner where capability, pedigree and reliable long-term performance are concerned. For more information or a test drive of the enhanced 2014 4Runner, visit your nearest Toyota dealer.